Last weekend we played at a love filled yoga center in Setauket, NY called Yoga for Life. 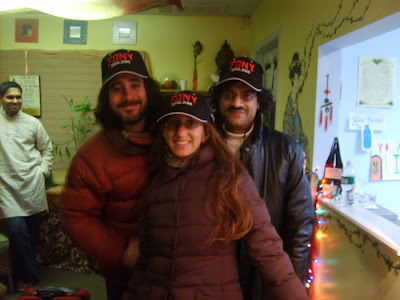 The owner, Sal, a New York City Fireman offered us these FDNY (Fire Dep't of New York) hats. We felt like honorary members of the department :). Sportin' the new look with me is Mira and guitarist Rama Bala (See Photo). The night after, we also had a bliss filled Kirtan at Integral Yoga Institute in NYC, another love filled venue. This weekend we're in Philadelphia then off to Florida for a couple of weeks of events and Kirtan College. Looking forward to the sunshine. That's all for now. Sending Love and a Big Hug! I hope you all enjoyed the Holidays and are ready for an adventurous and joyous 2009. I wanted to take a moment to say a few words about our Kirtan College Program coming up, February 15th to 22nd at Kashi Ashram in Sebastian, Florida. Kirtan College is for those of you who have been touched by the healing gifts of Kirtan, Chanting and Bhakti Yoga and who seek a means of empowerment to bring these ancient practices more intimately into your daily life. If you have been thinking about joining us, now is the time to take that step forward! I must say that Kirtan College is truly one of my favorite and most high - spirited programs. Last year there was so much depth, joy and presence in the experience. The participants were all committed to going deep and as a result, that's just what we did. Those who attended Kirtan College '08 were all profoundly touched and have carried what they learned into their lives in ways which have brought great inspiration, joy and transformation...and some have since gone on to lead public Kirtans! I wholeheartedly recommend Kirtan College for those drawn to Kirtan and Bhakti practice and guarantee that you will leave with some wonderful new tools and will revel in the richness of your experience. You can go to the Kirtan College option on my website to read more about the program. There is also a wonderful article there written by Kelly Bodden, sharing her experience of Kirtan College. Please note that Kirtan College accommodates those interested at all levels. You don't need to be a musician or want to lead Kirtan with others to participate. Lastly, Kashi Ashram is an absolutely majestic and spiritually charged setting and Sebastian, Florida in February is warm and lovely!! For more details and to register, please go to the Kirtan College option on the home page of my website - www.davidnewmanmusic.com. If I can be of any support, please don't hesitate to let me know. "On The Bhakti Trail - SEVA Edition"
Om Namah Shivaya Everyone and Happy New Year!! I wanted to share with you something I have co-created with my friend Hillary Branoff. It goes out as a newsletter and is called "On the Bhakti Trail - SEVA Edition". Below I have included our first issue for January '09. It will come out the first of every month. So, enjoy and hope you find inspiration in it. Welcome to the first edition of "On The Bhakti Trail - SEVA Edition." This newsletter is to provide information and education on a variety of issues that inspire us, "To Be The Change". Our intention is to raise awareness surrounding these themes so we can then make informed choices about what we eat, what we wear, who we support, what we buy and where we spend our energy. We can also make a difference by passing the information along- spreading awareness, signing petitions, joining an activism group, donating funds and/or time, speaking to politicians and creating your own Sacred Activism project! Please enjoy our first edition's theme of AFRICA. The Africa Yoga Project's vision is to develop and support programs that empower youth and support well-being in East Africa. If you are a Mid Wife or Doula this project will surely interest you! Shanti Uganda is an organization dedicated to helping children, women and communities in Uganda find peace and health. Shanti Uganda's projects combine healing, birth education and community development initiatives. The Philani Child Health & Nutrition Project has changed the lives of thousands of women and children in disadvantaged communities on the outskirts of Cape Town. One aspect of this project is education through song. Many people in this South African culture sing all day long and the health educators/nurses had a brilliant idea which was to create songs to spread awareness about health and nutrition. The second project has taken these songs, mixed them and created an awesome CD that you can purchase on line. All of the money goes towards the project! I love the Divine Flow this project is! This is one of the most inspiring films I have ever seen. It is a wonderful demonstration of how following your heart and taking small step by step can lead to massive transformation! A documentary that tells the story of the, "Lost Boys" a large group of Sudanese boys who become refugees in Kenya. The film follows the lives a few of these men who are given an opportunity to begin a new life in America. Get out the tissues for this documentary! The story follows the courageous efforts of Patongo's students as they pour their hearts into winning this year's music competition. Community, dance, music and hard work bring great healing to these precious children of Uganda. Long Walk to Freedom is Mandela's moving and exhilarating autobiography, a book destined to take its place among the finest memoirs of history's greatest figures. For the first time, Mandela tells the extraordinary story of his life - an epic of struggle, setback, renewed hope, and ultimate triumph, which has, until now, been virtually unknown to most of the world. Kaffir Boy by Mark Mathabane is a true story of a Black youth's coming of age in Apartheid South Africa. An incredible inside look as to what it was like to grow up in the Townships of South Africa. Life & Times of Michael K is a 1983 novel by South African-born author J. M. Coetzee, winner of the Nobel Prize in Literature for the year 2003. The book itself won the Booker Prize for 1983. The novel is a story of a simple gardener Michael K, who makes an arduous journey from civil war-ridden urban South Africa to his mother's rural birthplace, during an imagined near-future within the apartheid era.